Just remembering all the wonderful trips to Gettysburg every year and took time to go back and revisit one of those spots I first saw many years ago. Well, whats happening at Lee's headquarters is an interesting side post to the the current state of the park. Private money going to the upgrade and maintenance of a historically important edifice. Right now it looks like a Detroit property that went into foreclosure back in the mortgage meltdown era. Or better yet a new location for Gettysburg's first Starbucks. 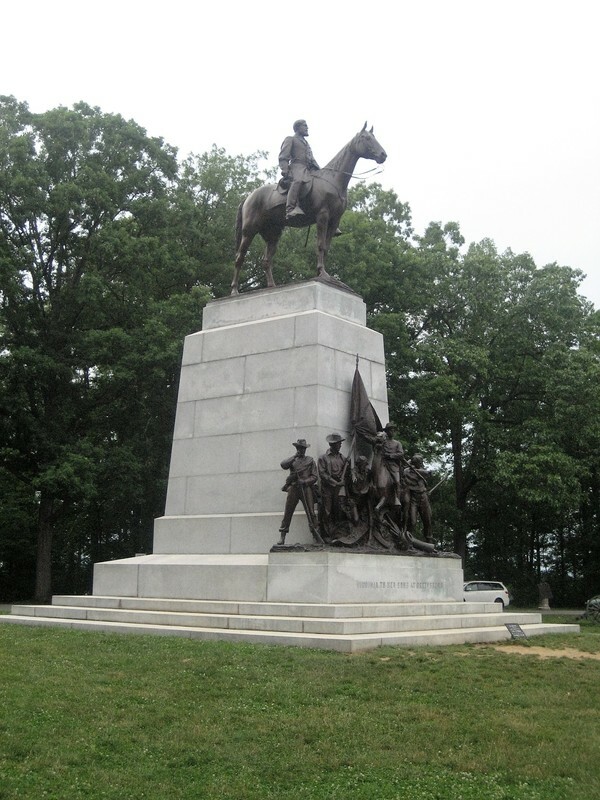 Its the latest ambitious project of the notorious Friends of Gettysburg organization. Those who know me understand my feelings and dislike of their Gettysburg museum that is too expensive for a family to go to. Everything they touch seems to become some politically correct composite of what history should be and Im sure this will be no exception. In a couple of months we will see if they charge an admission to their latest conquest. Maybe it should be a Starbucks at least we would get free admission. Somewhere on the back roads of Virginia, specifically between Fredericksburg and Richmond lies the little hamlet of Guinea Station. During the war it was the supply base for the Confederate Army and a major rail hub. 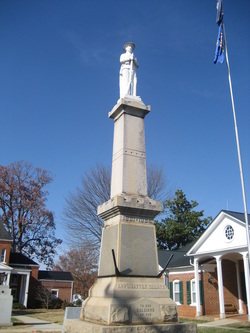 It also has the inauspicious history of being where a very important man in the Confederate Army had his arm amputated and eventually lost his life. Stonewall Jackson could have lived, he was recovering. But Pneumonia took hold and he died ,so the rest is history. If he lived there would be other battles but the results ultimately would be the same, the new Confederate nation would be defeated. But oh what a different drama would be played out. Think Gettysburg with Stonewall on the first day and you can have a fun time imagining all the scenarios. The area around Guinea Station is quite and somber now. Apparently no one visits, except of course the staff of Confederate Planet . Image. Cottage where Jackson died and where his arm was originally buried. About 151 years ago a Seminary College in a little nondescript Pennsylvania town was the center of a national controversy that could only be resolved by the spilling of American blood. Now the Lutheran Seminary is the home to a brand spanking new Civil War museum. Did they do a good job? Yes and no. The interactive displays in each room are well done with life like mannequins in all sorts of gruesome poses. Some are so life like you can almost feel them move when you turn away. Spooky and cool. But unless you want a lot of thought provoking reading material to ponder, you might do better at a Civil War Show to see real relics. They have a few things on display and I cant wholly discredit the place because its not stuffed with Confederate artifacts. Anyway, its worth a stop if your in town. Photo. A family visit to a Union officer recuperating at the Seminary Hospital circa 1863. This is the letter we sent to the Museum regarding their press release about the merger and move. Right or wrong, you readers be the judge. The bold is the CEOs Waite Rauls answers to confederateplanets questions. Good questions all. See below. Photo. 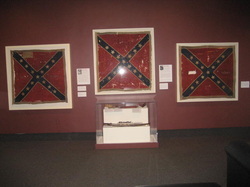 Current exhibit at the Museum of the Confederacy, Battle flags from Gettysburg They Walked Through Blood. South of the Potomac, the buck stops here. The smoke has cleared off the field and the old soldier is home on his couch safe and secure. Sounds like a veterans remembrance from 1886, but sadly no, I decided to do the Gburg reenactment for the 150th and Im still recuperating. Of course I went to the collectors show, took a side trip to Winchester and ate a whole lot of great food, but that's another story. I also decided to take along my daughters boyfriend and together we would represent the 6th Virginia and die in Picketts charge. Being kind of an independent spirit (I was a horrible soldier in the Army way back) the decision is to go in as "walk ons" a term used to denote the unaffiliated 21st century CW soldier. First off the bat was to create a uniform from scratch for my young friend. This was done on the cheap with the help of Goodwill Industries and a needle and thread, a perfect Battle Shirt, pants and Slouch Hat were fabricated. The rest were acquired from Ebay and spare stuff I had on hand. So knowing the drill of these affairs, we would skip the first two days of battle and just mosey on to the field for the real deal, Day 3 Picketts Charge. We straggled into camp an hour before the battle and sat in the woods waiting for the grand cannonading to stop. I must admit the sound was impressive. The booming and bellows of smoke were realistic but sadly there were not so real Confederate soldiers taking selfies and posing for the cell phone cameras. More hilarity abounded when a pretty young girl in CS garb approached us. She had a ridiculous painted on mustache and the baggiest pair of pants ever created. She appeared as a Confederate Chaplin ( I mean Charlie), well who am I to pass judgement I look equally out of place in Confederate garb. Im more of a restaurant connoisseur than dangerous reb and my waist line belies that fact, but I digress. Suddenly, the cannons fall silent. We quickly gather our weapons and are shoved into position. Weve managed to attach ourselves to a group that will go over the proverbial stone wall (Armisteads) and although they know were tag alongs, they thankfully dont kick us out of their party. Ah, the drums beating, orders shouted "fall in, fall in men" a speech by a good Pickett impersonator alla imitation southern drawl, " Remember you are all Virginians." Did he really say that? And off we go, a cardiac stress test in a wool uniform in 90 degree heat, I quickly fall behind. Some accountant on a horse is screaming "keep up ,double quick, move, move." Easy for him to say mounted on an animal, that given a choice would rather be grazing oats somewhere. We cross a gully with a little, little stream which practically shatters my leg and soaks my foot. Im breathing very hard but finally catch up just in time to see our dear captain ( only knew him for a half hour) fall dead in front of me sabre in hand. And still we come, closer and closer to the stone wall. Men in front fall prostrate in different throws of imitation agony. Some others, more well rehearsed, shout curses at the Yankees as they pass through our dwindling line in retreat " go get em boys, give them the cold steel" This all transpires in a few short minutes, and now I would myself fall victim to imaginary Yankee bullets. My parting words to my young friend " Go to the wall, Im dying "closed my performance for the drama. As I sat on the grass and watched the remaining moments of the reenactment, the boys going over the wall into a mass of blue and smoke, I thought "well this was what it was like 150 years ago" as I quietly snapped a picture with my Korean cellphone. Photo, The Young Recruit. Has it been a year already? Well almost. What a great idea, a portal for all things Confederate and surprise! Its actually quite popular and growing every day because of people like you. Thanks all, keep coming back and enjoying and contributing to the site. Took the annual trip to the Baltimore gun show and of course made a side trip for the guys in the car to enjoy. I never tell them where we are going for these trips, I just like to see the surprise or disgust on their faces depending on the attraction, (Baltimore Station didnt go over well). This one was off the beaten path in the heart of the urban blight of B more and they loved it. 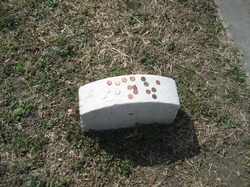 The most amazing thing were the pennies bent through the head on the unmarked grave. Can you guess? Photo. Green Mount Cemetery, Baltimore. Md. unmarked grave, do the initials J.W.B.ring a bell? We made it. A two hour ride turns into four but were here, the new Museum of the Confederacy. Its not big, but there's still a lot to see. Wonderful uniform displays highlighted by the frock coat of General Cleborne that is so moth eaten its just a mere fragment. The Western Armys greatest general, he was killed needlessly at Franklin, but you all know that story. If you go make sure you eat at Granny Bee's Restaurant for lunch. Actually, its the only place in Appomattox for lunch that we could find, its a really small town. 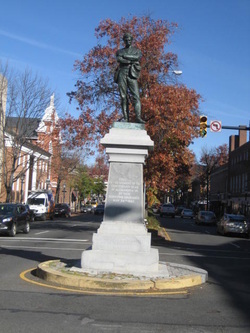 What I didn't know was that there's like three or four miles between Appomattox Station (the town) and the NPS site (the courthouse) were the surrender occurred. The site is eerie and quite with no other cars in the parking lot. We are the only visitors and that's sad, but one doesn't stumble upon this place by accident and the ranger tells us that its a little busier during the weekend. Mr Mcleans house was rebuilt in the 1960s and doesn't look a day over 100. Its nice to finally be here after all these years, and unlike the rest of America, appreciate the nation that preserved this for us.